I had bought some shrimp to use in a pasta salad for a picnic we were supposed to go to. Unfortunately, we got our dates mixed up and we weren't able to go to the picnic, so I tossed the shrimp in the freezer and figured I'd use them in something else. 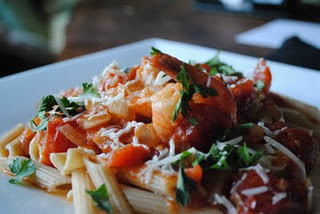 When this recipe came up on Gimme Some Oven, I quickly took those shrimp out of the freezer and used them up. This recipe was absolutely delicious! The heat from the red pepper flakes added the perfect kick, and the parsley added a great freshness. This would have been just as great if we substituted chicken for the shrimp, or even if we left the protein out all together. Heat 3 tablespoons of oil in a large skillet over medium heat. Season the shrimp with salt and pepper, then add to the skillet. Sauté for 1 minute, then flip the shrimp and sauté until the shrimp is cooked through and no longer translucent. Transfer the shrimp to a separate plate. Add the onions and an additional tablespoon of oil to the skillet and sauté for 5 minutes, or until translucent. Add the garlic and sauté for another minute. Add the wine and deglaze the pan for 1 minute, then add the tomatoes, red pepper flakes, and oregano. Reduce the heat to medium-low and let the sauce simmer and reduce for 10-15 minutes, until it is your desired thickness. Return the shrimp to the sauce and stir to coat. Meanwhile, bring a large pot of water to a boil and cook pasta according to package directions. Drain the pasta and toss with the sauce and shrimp. Garnish with chopped parsley, basil, and parmesan cheese.